WILLEMSTAD - “50 days of Cabinet Rhuggenaath and what has changed in Curaçao?” asked the leader of the opposition party MFK, Gerrit Schotte in a press release. According to Schotte the economy is paralyzed, there are no new jobs, the government is hunting after civil servants, there are investigations and more investigations and people are being laid off everywhere. 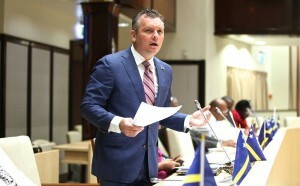 Schotte indicated that normally a Prime Minister uses his first 100 days to set his footprints on how he will govern the country in the next four years. He does this with actions and important goals for the people. The most important projects and initiatives will be laid out and executed in the first 100 days. Schotte used as an example the former President of the United States, Barack Obama who eight days after he took office he was in Congress to pass a law named the American Recovery and Reinvestment Act 2009 which is an economic stimulus package to boost the economy of the U.S.A.
A political party knows way ahead of its electoral victory what it has to do to change the course of the country in the first days. The advisors prepare a plan that has to be executed immediately. This way there will be several actions in the first 100 days. Schotte says that this is the modus operandi of every government in the world. They set the standard for their government term. Schotte asks how many jobs has Rhuggenaath created in his first 50 days? “All the government has done is announced that they will use 90 days to work out an urgency plan to tackle the most pressing problems. This means that they started their term without a plan.